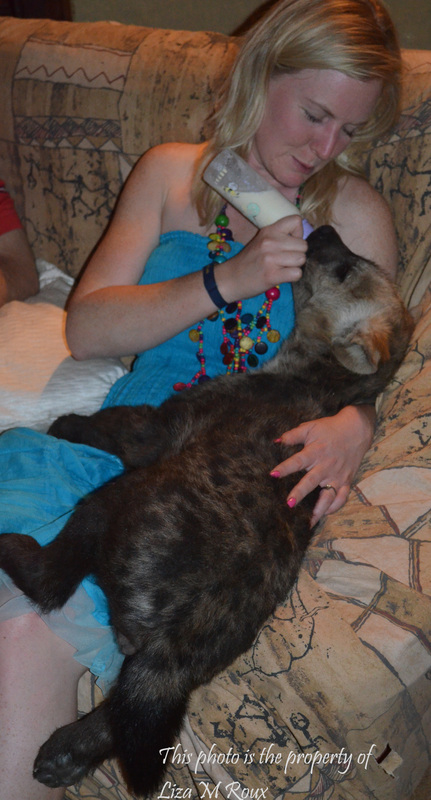 So, here I was with an estimated 6 day old Spotted Hyena baby. It was pitch black with tiny ears that were close to its head. 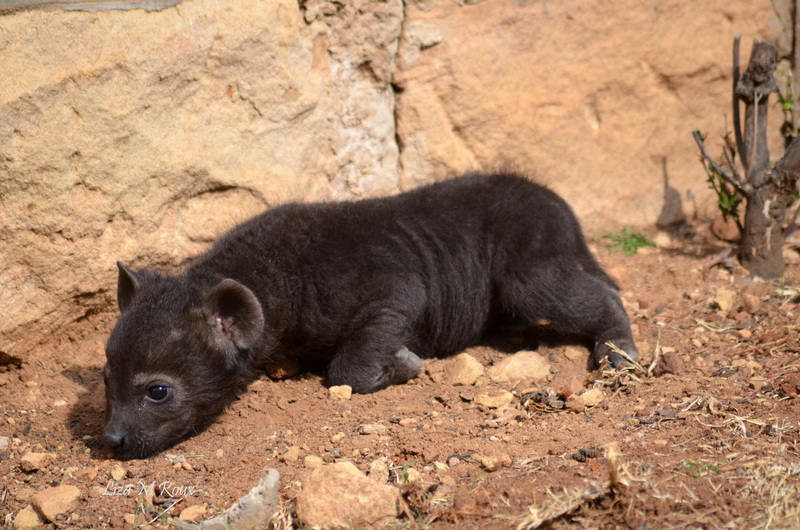 Spotted Hyena babies are born with this eyes open, but they can only start seeing properly after more or less 10 days. 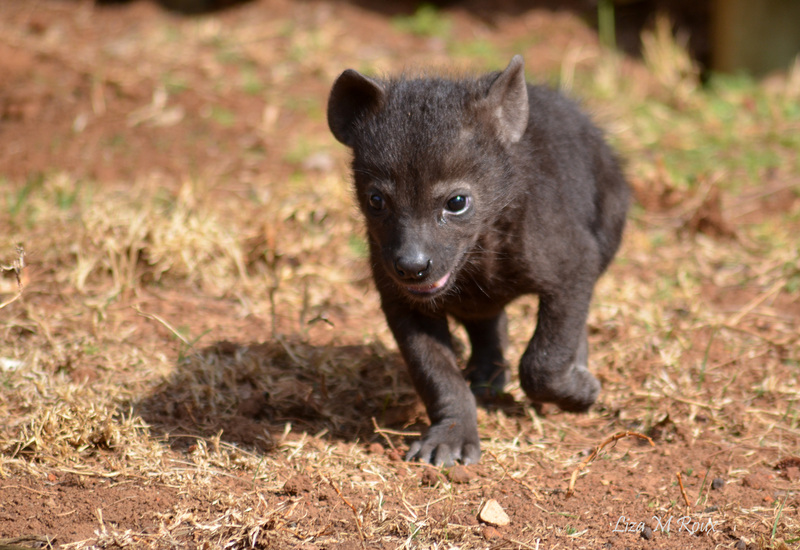 They are also born with some (very sharp) baby teeth in place. 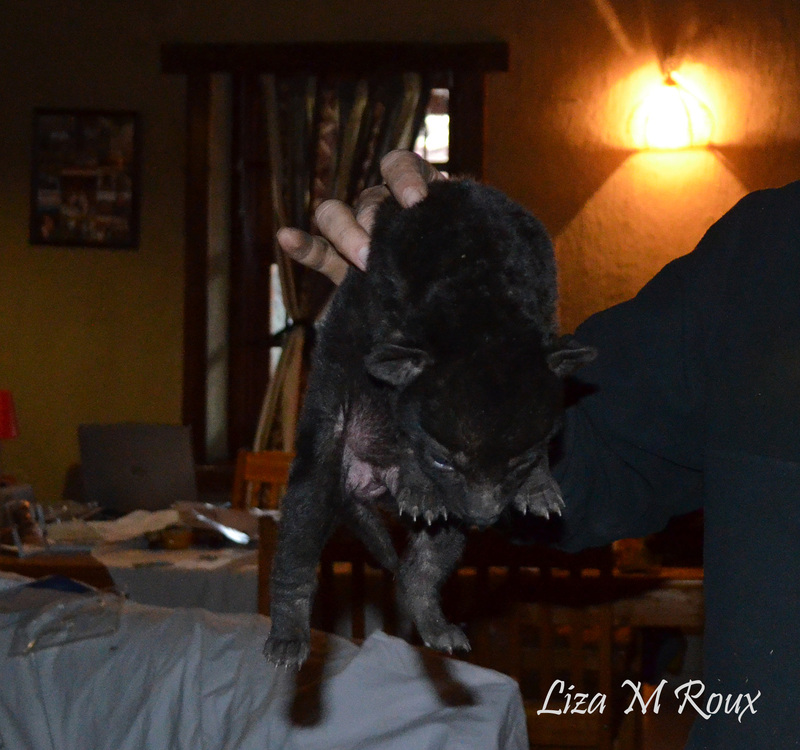 I weighed the little hyena and on the first day I had it, it weighed 1.7kg. Even though it was tiny it was much stronger than any puppy would feel at that age. It had a hard tough feeling skin. 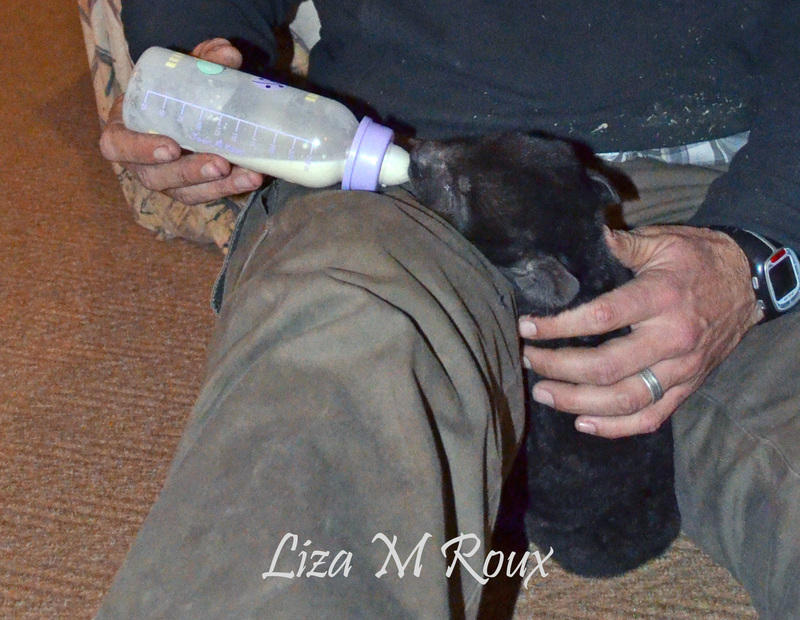 We bought formula milk from the veterinarian and some extra calcium and fatty oils to add to the mix. In the beginning I had to feed quite regularly. I also had to stimulate bowel movement by gently rubbing over the stomach. I kept a feeding journal to keep up with what, how much and how often I am feeding to keep up with its progress. And also in case I needed to contact the vet if there was something that was bothering me. She lived in the house full time until she was 3 months old. After 3 months I couldn’t handle her in the house anymore. She was way to busy. She slept outside behind a couch for a bit and then one morning, I could not find her close by the house. I searched for a while and found her where she enlarged a hole underneath some rocks. She made herself a den in the garden in which she stayed for nearly five months after that. She still came to visit us in the house. 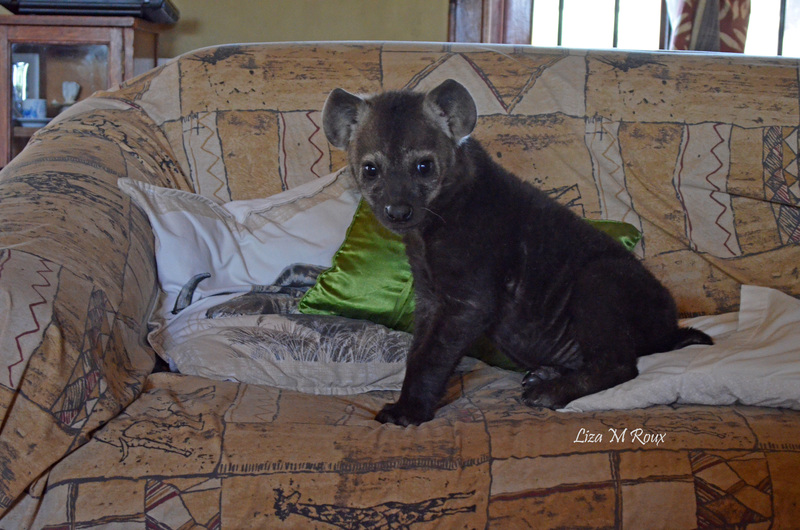 *Hyena cubs drink milk up to the age of 1 years or even a little bit older than that. Before the age of 3 months, they will not eat even a little bit of meat. When we tried to give it some meat, it would just roll in it and rub itself against it. After 3 months, she would still only take little bites of meat, her main nutrition stayed milk for a full year. *It is also an extremely mobile animal. It climbed into and onto places our dog still hasn’t figured out how to get there. *It would often come and rub up against our feet when we took our shoes of or jump inside the dirty laundry basket and roll around, presumably to get our smell. *It was very smell sensitive. One day, I applied perfume before trying to feed it. It did want anything to do with me. I had to go and wash and only then would it drink the milk. *It was a wonderful animal to raise because it loves physical contact. *They are very quickly scared and quite careful, but also very curious. That’s why they come back to investigate again after getting scared by something. *Male and Female hyenas external genitalia looks very similar. The females genitalia mimics that of a male. And they can be difficult to distinguish. Crocuta is a female. She has swelling in her scrotal area, but there is no testes inside, only fat. 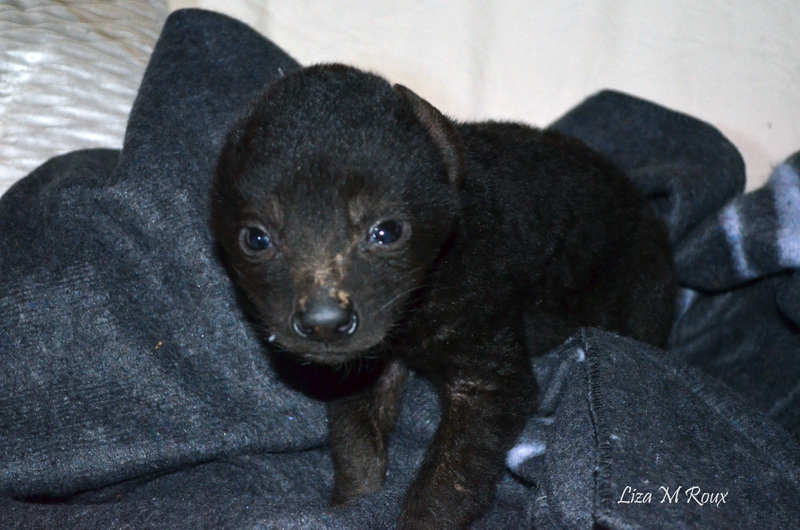 *Her first little spots started appearing between 3 and 4 months. I am concluding my post part 2 with some more images of Crocuta. In the near future. 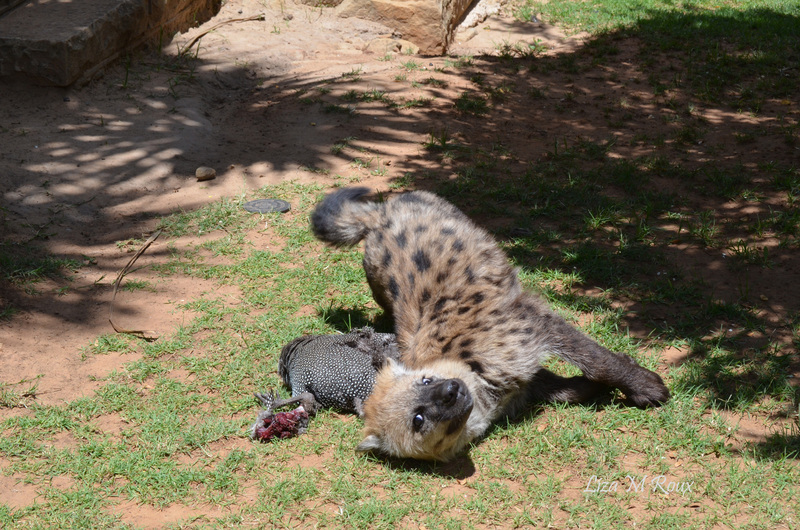 I will share some more thoughts on the raising of Crocuta and on Spotted Hyenas. That is just so special. What an experience! I still remember how my jacket got missing when I came to visit… found it in pieces behind that couch. Love your deep love for animals. Ek is mal oor jou blog!!! Veral die verhaal van Crocuta fassineer my! Skryf nog!!! Baie dankie 🙂 Ek sal verseker nog skryf. Kyk daai woelwater met die tarentaal! Nice article and I can’t wait to see any follow up. Thank you. Hi James. Thanks for your comment. She is still safe. Thanks for the interest. I will write an update on Crocuta very soon. You are so right. Wild animals are incredible. Bly om dit te hoor, want ek is nou nuuskierig oor Crocuta se verdere avonture.